A little something different today. Larry Day entertains us with how he got stated writing. Miss Bunker (I can’t remember her first name) was principal of East Side School in Idaho Falls, Idaho, circa 1945, when I was in Miss Melton’s (I can’t remember her first name) fourth grade class. Dean Larsen, who sat in front of me in Miss Melton’s class, wrote a smart aleck note and passed it back, unnoticed, to me. I wrote “Screw You!” on another piece of paper and passed it back. Miss Melton saw me pass the note back to Dean, and told me to bring the note up and put it on her desk. She went on with the class. I forgot about the incident until the next day when Miss Melton told me to go see Miss Bunker. In the Principal’s Office, Miss Bunker had the note inher hand. That’s how I became a writer. From that time to the present I’ve written a lot of fiction. Some of it was written for newspapers and international new services. I’ve reported for the Idaho Falls Post Register, The Deseret News (Salt Lake City) The United Press International (from Buenos Aires), the Minneapolis Star and Tribune, The Miami Herald, the Kansas City Star, Universal Press Syndicate. Everyone knows that newspaper stories aren’t supposed to be fiction. But with tight deadlines, and because journalism is more art than science, a lot of creativity is involved in covering the news. I’ve written news stories from the United States, Latin America and the Caribbean (including Cuba), the Sudan (Africa) Botswana (Africa) (the old) Yugoslavia, England, Hong Kong, and Letongaloosa (a fictional town in the U.S. Midwest). Many newsstories, carrying my byline, were actually published by newspapersor by news services. For the past dozen years I have been writing humorous fiction for the Kaw Valley Senior Monthly of Lawrence, Kansas. Do I notice a difference between the fiction writing I do now and the news writing I did as a journalist? Yes, I do. Fact checking is more rigorous on the Kaw Valley Senior Monthly than fact checking was during the days when I covered coups and earthquakes in Latin America. A horse that Larry Day’s mother was riding on the way to the hospital to deliver him bucked her off into a patch of four leaf clovers. Larry has felt lucky ever since. 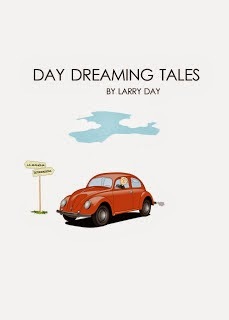 Day Dreaming Tales is a book of humorous short stories (700 words maximum). The stories were written over a 10-year period for publication in a small monthly newspaper in the Midwest. The stories have disparate plots and topics and characters. A few recent characters are reprised (in new plots) from earlier appearances. The book is divided into the following theme (topic) sections: Media Marvels, Weird Rich Folks, Corporately Clueless, Alien Encounters, Marital Blitz, Hilarious Higher Ed, Home Town Folks, Fairy Tales Redux, Luv a Guvmint.